PREVIEW: CENTRESTAGE, Asia’s premier fashion event, will open for the global audience from September 5 to 8 in Hong Kong. 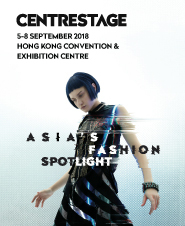 Organised by the HKTDC to consolidate Hong Kong’s position as a fashion hub in Asia, CENTRESTAGE offers a platform for international, especially Asian, fashion brands and designers to launch and promote their designs. In its 3rd year, the opening gala, CENTRESTAGE Elites, will see three of Asia’s most celebrated designer labels, Facetasm from Japan, Idism from Hong Kong and Ms Min from the Chinese mainland, showcasing their latest 2019 Spring/Summer (SS19) collections for an international audience of trendsetters.